Ross uses granular, slow-release fertilizers with micro-nutrients for sustained growth and superior color. Timely applications of pre-emergents are critical to weed control. Although not a cure-all, pre-emergents help by preventing weed seeds from germinating. Our weed control program also incorporates recurring applications of post-emergents to target weeds that sprout in spite of our best intentions. Chinch bugs, mites, chiggers, ticks, fleas, and grubs are among the many insect pest that can damage a lawn or make it miserable to be in your lawn. Although not as common, diseases can also affect the health of your lawn. If your lawn is under attack, Ross is ready to respond. Yes, I know fire ants are an insect, but for Texans they deserve their very own treatment program. 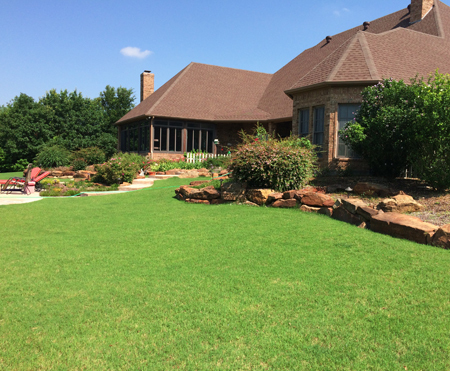 One application of Topchoice® to your lawn and landscape beds keeps fire ants out for a full year…guaranteed.